The Minahassa Masked Owl is a medium-sized owl with short rounded wings and no ear-tufts. It is also known as the Minahassa Barn Owl or the Sulawesi Golden Owl. Typical call - Lore Lindu NP, Sulawesi, Indonesia. December 1998. CC Raf Drijvers. Description: The facial disc is relatively small, pale cream, tinged reddish, with brownish shading around the eyes and towards the base of the bill, which is whitish-cream. The rim is rufous-brown with some darker speckles. Eyes are blackish-brown. The crown to the upper back is greyish-brown, speckled white and black. There is a half-collar on the hind neck which is darker than the surrounding plumage. The rest of the upperparts are more golden-brownish, somewhat mottled greyish, with relatively large white spots bordered black on their upper half. Wings and tail are ochre with several dark bars. There is a narrow zone at the edge of the wing from the carpal to the base of the primaries which is dark greyish-brown with white and orange-brownish spots. Underparts are fulvous-white to pale ochre with fine blackish spots. Legs are feathered uniform ochre to the base of the bare reddish-grey to greyish-brown toes. Claws are blackish-brown. Size: Length 27-31cm. Wing length 239-272mm. Tail length 102-122mm. No weight data available. Females are larger than males. 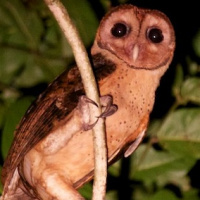 Habits: The Minahassa Masked Owl is a nocturnal bird, but little is known of its ecology and behaviour. Voice: A screech similar to other Barn and Masked Owls. Hunting & Food: Probably similar to other Barn and Masked Owls, with small mammals predominant. Breeding: Little known. Likely nests in hollow trees in early April. Fledged juveniles have been observed being fed by parents in early to mid September. 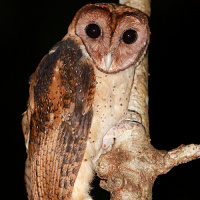 Habitat: The Minahassa Masked Owl lives in primary tropical rainforest with lianas, ferns, palms and epiphytic plants, as well as drier, degraded forests from about 250-1500m elevation. 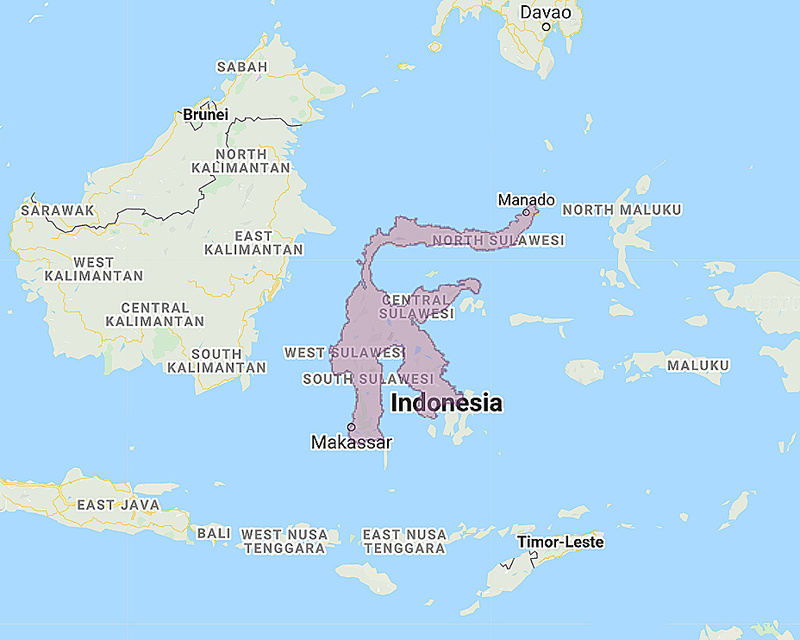 Distribution: Minahassa Peninsula in Northern Sulawesi. Original Description: Schlegel, Herman. 1879. Notities van Rijksmuseum van Natuurl. Historie. [Notes of the Leyden Museum], 1, p. 50-51. Page by Deane Lewis. Last updated 2016-05-26.